When Caleb wakes up he usually says four things: hi dad, horses, mommy, and “oat-me.” He is always excited to start the day and loves eating oatmeal with mommy. We eat oatmeal for breakfast almost every morning. I usually keep things simple by adding a banana and cinnamon to our oatmeal, but sometimes I like to mix things up by making baked oatmeal. 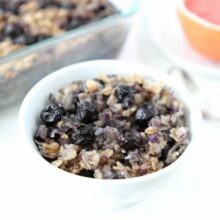 Our new favorite oatmeal is Baked Blueberry Coconut Oatmeal. I love this recipe because it is so simple and we can eat it for almost an entire week. It is great reheated in the microwave with a splash of milk. I love easy breakfast mornings that taste so good! I used coconut oil instead of butter and added in shredded coconut. Coconut lovers are going to go crazy for this baked oatmeal. 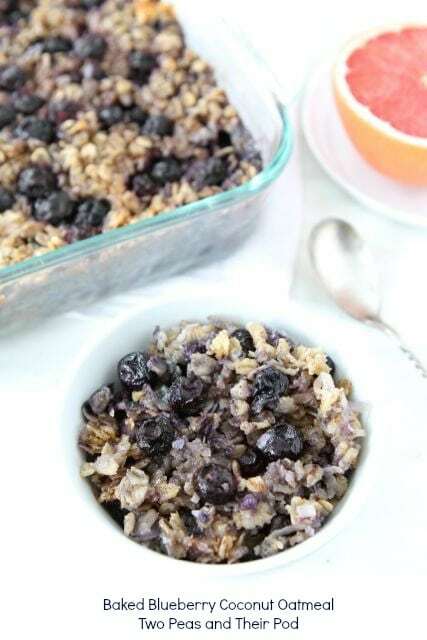 Baked Blueberry Coconut Oatmeal is great for serving a crowd or you can make a big pan and reheat it during the week. This recipe makes an 8×8 pan, but you can double it to fill a 9×13 pan. Baked oatmeal with blueberries and coconut is a great morning treat. Make a big pan to feed a crowd or to reheat during the week for an easy healthy breakfast! In a medium bowl, mix together the oats, coconut, brown sugar, baking powder, salt, and cinnamon. In another medium bowl, whisk together the milk, egg, coconut oil, and vanilla. The coconut oil might get a little lumpy, but that is ok. It will melt when baking. Note-this baked oatmeal is great reheated in the microwave. We like to add a splash of milk! This recipe makes me want to jump up and start making it right now so I can have some for breakfast today. Great combination of flavors. Yummy! Love the blueberry and coconut combination! Looks delish! Can’t wait to bake this recipe up!!! What a perfect breakfast. Warm blueberries are the best. I’m in love with blueberries and the ones we are getting in Florida right now are plump and juicy. I definitely need to give this a try! I love that Caleb wakes up saying “oat me”!!!! This looks insane! Love this idea! I’ve made baked oatmeal before, but it had tons of sugar and maybe even cream. Going to try this, because my tot loves oatmeal and blueberries! I’m obsessed with coconut oil!! I love adding it to anything that makes sense! This recipe looks amazing. Totally pinning! This looks so great Maria! Delish! You can’t go wrong with that flavour combo for breakfast! I love the blueberry and coconut combination! Perfect breakfast! 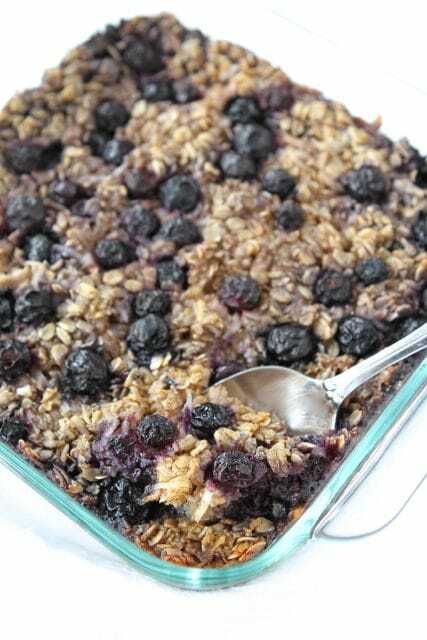 Love baked oatmeal ~ especially with blueberries! We love baked oatmeal and this looks fantastic, Maria! Man… I wish I would have eaten THIS for breakfast! I’m with Caleb, “OAT ME”! this looks great! Have you thought about baking this in muffin tins for easy portions? How long do you think they would bake in a muffin tin? I really have to get on the baked oat meal bandwagon! Blue berry and coconut is one of my favorite flavor combos. Caleb has impecable taste in his morning “oat-me!”. Geez that kid is too cute for words! We have oatmeal almost every morning too. Love the twist with coconut! 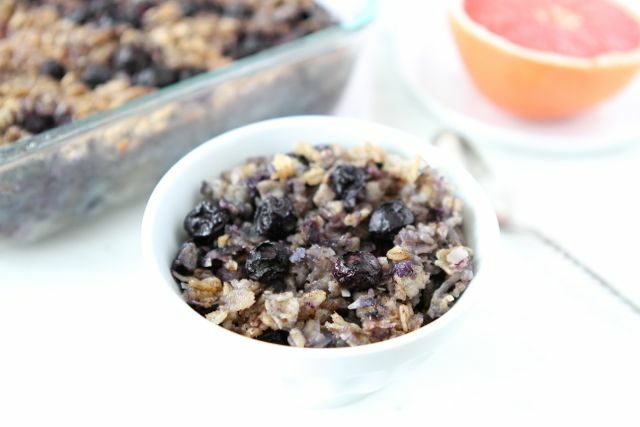 I have oatmeal almost every morning too – love this combination and will try it this week! Haha too cute! Oat-me 🙂 This oat-me looks so perfect! LOL that is sooo cute!! “oat-me” you have a cutie 🙂 i have oatmeal every morning and this looks like the perfect oatmeal to have! so filling and full of flavor! Yay! So glad you liked it! Thanks for letting us know! This sounds delish, but my favorite part is that “horses” is also on his top list of words hahaha. Love the little stories you always add to posts! 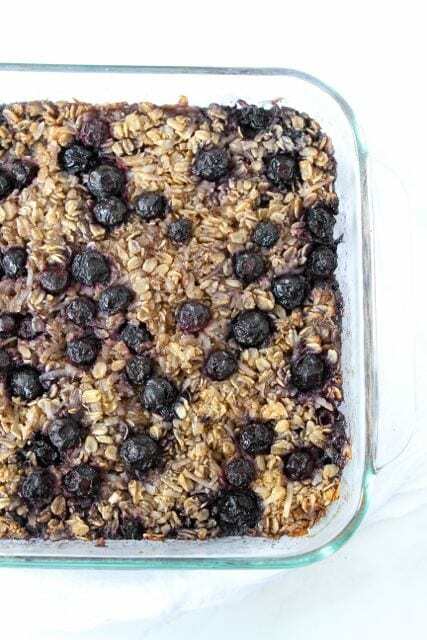 I can’t make enough baked oatmeal, and this one has one of my favorite flavor combos — blueberries and coconut. I think maple syrup would be fabulous in here, too! After making your amazing Coconut granola……that I am totally addicted to…..I will make every coconut recipe you come out with! Yum, yum….this look awesome! Thanks so much. I am glad you like the coconut granola! This sounds wonderful! I love making oatmeal for my toddler and myself to enjoy all week as well. So easy and delicious. This version looks like a must try! Yum. I have everything on hand except the coconut oil. Can I use something instead of coconut oil? He is so adorable. I love the oat-me and this breakfast! sounds like the perfect breakfast for me I LOVE blueberries! I love coconut and I think we’d love this oatmeal…I really like the firm texture of it 🙂 And Caleb is SO adorable…I can’t wait til Lucy starts talking too!! excited to use my coconut oil, I’ve got it, but scared to substitute with it!! this looks scrumptious! (Saw you were at BYB13 with a few of my buddies and am sad I couldn’t be there…looked fun!! Baked oatmeal is one of my favorite things to have for breakfast. Especially with Blueberries! I love that caleb love blueberries and oatmeal! Too cute. This really is the perfect thing to wake up to! I want to come over and have breakfast with you guys! This sounds so fabulous! It’s the ideal way to start the day! What a great way to switch up the morning oatmeal! Yum! This looks like a great way to start any day! I will need to make this soon! This looks delicious! I miss blueberries, can’t wait for summer! I just made your coconut granola tonight, and my husband called it crack. I ate a bunch every time I stirred it. Really good! I am glad you liked the granola recipe. It is my favorite! All the bloggers are cooking up oatmeal this week. Must be something in the air? Great recipe! This looks amazing! Blueberries are so good for you too! I just put this in the oven….I am a stay at home Mom of 18 month Twin Girls. So this will be perfect during the week. Thank you for taking time during your day to share your recipes and stories with us. oh I LOVE baked oatmeal! I made some last week I’ll be sharing soon – can’t wait to try this one next time! I love baked oatmeal, especially with blueberries. Coconut is another favorite of mine, so I absolutely have to try this! I’m totally going to make this. I love your apple cinnamon version, so I know I’ll love this one! I am so glad you had fun at the conference. And I am so glad you came back and said hi at Sweet Tooth Fairy! Loved meeting you! We had the same idea yesterday! Last night I decided to make some coconut oatmeal with berries. Instead of milk I used coconut milk, it came out really good. Hopefully I’ll get a chance to put the recipe on my blog soon. *QUESTION on a recent post: wanting to make your turtle cookies (posted 2/13) & last time i tried your salted caramel sauce, it crystallized royally! no burning & i followed the instructions to the letter – it didn’t just go sugary, we’re talking HUGE chunks of solid rock sugar. i’ve made caramels many times & other types of caramel sauces, i really have no idea what happened! is it ok to use a metal whisk, or only something non-reactive like wood or silicone?? The sugar does crystalize and get hard. If you keep whisking it, it won’t form big clumps. It will form pea size crystals though. Yes, you can use a metal whisk. I sometimes switch back and forth between a whisk and wooden spoon…if the crystals are getting stuck in the whisk. I hope that helps! I think this would make every blustery, winter morning all the more bearable. I don’t have any coconut oil right now and this looks so delicious I want to make it now. Is it required in this recipe? Also do you have to use skim milk or can I use another variety of milk? The coconut oil brings out the coconut flavor. If you don’t have any you can use butter or canola oil. You can use any variety of milk. Yummo! Can’t wait to give this a try, Maria! I made this this morning after reading your post yesterday, and it was sooooooo good. The best part was it really kept me feeling satisfied until lunch. I eat oatmeal regularly, but still feel hungry 2 hours later. This kept my tummy happy!!! Also kept smiling about oat-me as I enjoyed it 🙂 Thanks! I am so glad you enjoyed the baked oatmeal. It is a great way to start the day! I have this in the oven as I type! Can’t wait to try it! This will be a great quick breakfast for my daughter and husband in the morning. Oh My Gosh……………..I made this just as the recipe said. I made it last evening and put it in the refrigerator. Then this morning I cut it into 8 pieces and ate one. It is the best oatmeal I have ever had. Since I am a widow and live alone this will last me all week. Thanks so much……Now to find the Coconut Granola recipe. This recipe is genious! I love the smell of the coconut oil baking in the oven. Thanks for sharing! Sammy loves his breakfast oatmeal still to this day, he eats his with bananas and frozen blueberries too! And crushed sliced almonds. 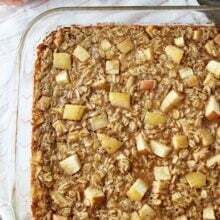 I have to try baked oatmeal, would make it so much easier in the morning! Opened the freezer and found frozen mango instead of blueberries! Coconut mango baked oatmeal? Yes, please. This sounds delicious! One question…. What happens if you reduce the coconut oil? Does it affect texture or make it drier? Thanks! Do you think this recipe will work ok with steel cut oats? I haven’t tried it with steel cut oats. You might have to bake it a little longer since steel cut oats take longer to cook. Maria…….I am really loving this. But I wonder….have you tried making it with any other fruit? I’m thinking frozen cut up peaches or strawberries. Do you have any suggestions? We haven’t tried it with any other fruit…yet! I am sure most fruits will work. Can’t wait to experiment! Let us know if you try anything! Can you use quick oats with this recipe? Thats all I have on hand…. I haven’t used quick oats, but I am sure they will work just fine. The texture might be a little different. I ‘like’ Two Peas and Their Pod on facebook. This is the first time I have baked with coconut oil. I tried your recipe and cant wait to try your other recipes using it. I loved it, my family loved it. The only problem was that there was none left over for the rest of the week. Thats how much my family loved it. Im planning to make more and experiment using different fruits. Thank you! Very tasty! We enjoyed it very much! This recipe is delicious! We use coconut oil for our homemade popcorn and it is divine! For anybody wondering about making ahead, I mixed this all up last night and stuck it in the fridge with frozen berries sprinkled on top. This morning I microwaved it on med for about four minutes to take off the chill and hurry it along then baked for 40 minutes at 375. It came out perfectly! My only changes were to toss some sliced almonds on top just before baking and to replace half of the vanilla with almond extract… So very good, even my not-so-into-healthy-food husband loved it and had seconds. I had mine with some yogurt on top, delicious. Love this! Made it with blueberries,coconut and used some coconut milk. Amazing! This week we decided to use raspberries, coconut and orange zest. So good! Thank you for this great idea. Love coconut oil…so healthy! honestly, I cannot stop making this and gobbling it up. I omit the sugar though and add half sweetened coconut. I made this this morning and I loved it! I will be making it many more times. I already have shared the recipe with my dad. Can’t believe I’ve never thought to bake oatmeal! I love a chewy oatmeal texture, so this looks heavenly! Going to run out and pick up some coconut oil today. Will be having this for breakfast tomorrow, thanks for sharing! I’ve been dying to make this recipe for ages and finally made it this morning …. OMG this is AMAZING. I’ve tried baked oatmeal before and didnt like it but this one is fantastic, love the coconut flavour. Thanks for sharing. I am so glad you are enjoying the baked oatmeal! It’s a favorite at our house too! What is the purpose of the coconut oil? Can you leave it out or use butter instead. You can use butter if you prefer. The coconut oil has a nice coconut flavor though. Do you know the nutrition facts or at least serving size and calories? This is absolutely delicious. I didn’t have blueberries on hand just half a bag of frozen raspberries and half a bag of frozen mangos. Will make this again. 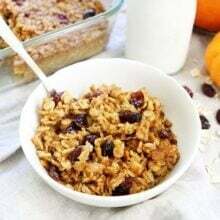 I’ve made a few baked oatmeal recipes and this is the best I’ve tried. I love that it incorporates coconut oil too! Thanks for the great recipe!! This has become a staple in our house. 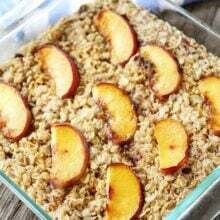 I have made many different baked oatmeals and this superior all the way! I’ve even gotten my in-laws, who had never heard of baked oatmeal before, hooked! Thanks for sharing such a healthy, yummy recipe! So good! Made this last night and had it for dinner and breakfast! I didn’t have shredded coconut, so I left that out but added some blackberries and bananas. Glad I doubled the recipe, my little guy (11 months) loves it too! Very tasty! I added one fresh peach to my dish! Verry yummy !! My kids asked two bowls of this oatmeal. Thanks for this awesome recipe. So easy to make and so delicious !!! Have you ever tried freezing this? Cooking for one~ Just wondered if it would freeze and reheat ok? I haven’t tried freezing it. It will keep in the fridge for about a week. I have to say…I literally make this every week (at least!) since I found this recipe earlier this year. It is AHHH-MAY-ZING! I always alter it ever so slightly, oftentimes adding two eggs instead of one, always double the cinnamon, usually leave out sweetener of any kind (I have two little ones who don’t need it, but I do add a touch of maple syrup on mine when it’s cooked! ), and I’ve used organic mixed berries, fresh peaches on their last leg and sometimes just organic raisins. It’s always perfect. It’s delicious cold or hot – fresh or not. Perfect with coconut milk or even ice cream! This recipe is a dream. Thank you for making my mornings smell divine, our home cozy and warm and our bellies happy! Wow! I just made this for tomorrow and tried a little spoon as I was portioning it into containers…. Oh my goodness this is tasty! I didn’t have enough blueberries so I used some cranberries as well… Yum-my! This is so delicious I have made double batches 3x in January already!! I also made it lactation friendly by subbing a 1/2 cup of oats for Brewers Yeast and ground flax. can i use something else instead of coconut oil? and will that change the flavor ?? What a great combination of flavors, it seems like your little guy s pretty good eater. I have had such fun with this! I changed it up a bit and substituted tart cherries. I put one can (drained) on the bottom of the pan and one on top. I also cut back a bit on the coconut, added chopped pecans and a few chocolate chips! Totally decadent! I use steel cut oats (only one cup) and assemble it the night before. I’m not a morning person and I can hardly wait for breakfast! I don’t have enough blueberries, so I’m making this with 1/2 blueberries and 1/2 raspberries. I’m also going to sub unsweetened almond milk for the skim milk. My daughter is allergic to gluten and dairy. Thanks for the great recipe! Can’t wait to eat it! Looks delicious. Will definitely be trying. I do have a question. If I was going to substitute honey for the sugar, any idea how much to use? Thanks!! i calculated points for Weight Watchers, 8 Points Plus. Just came upon this recipe a few days ago and have already made it twice! It is fabulous! My family loves it. It reheats wonderfully in the microwave (with the splash of milk). Great breakfast to start the day. Thanks for sharing! could this be made in a slow cooker over night? Do you think this recipe could be vegan by changing the skim milk for almond and the egg for a flax seed “egg”. Has someone tried this? Thanks! I use almond milk all of the time and it turns out great! I am sure the flax seed egg will work well too! Enjoy! I found your recipe today while searching for a baked oatmeal and knew I just had to give it a try. It is delicious and very filling. I made several little tweeks to your recipe to use what I had on hand. I sliced up 1 frozen ripe banana and a handful of fresh cranberries to go with the blueberries on bottom of pan and sprinkled with a little maple sugar. 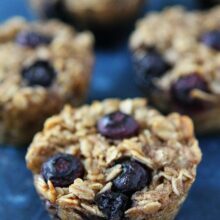 To the oat mixture I added 3 tsp of Cinnamon Flax and a pinch of nutmeg (I love adding nutmeg to my banana and/or blueberry recipes). Then added a few sliced cranberries to the blueberries on top of the casserole and again sprinkled with a small amount of maple sugar. It turned out incredible❣ I served it with some Vanilla Greek Yoghurt on top. Thank you for sharing your recipes and I look forward to trying more!! By the way I am gluten free so my rolled oat dish is gluten free! I’m going to make this and take it camping. I’m going to sub with coconut milk because our family is allergic to almond and dairy! Would this oatmeal freeze well? I have made the recipe several times and love it. I have a surgery coming up, so I’m making meals to put in my freezer. Would it work to bake and cool the oatmeal, then freeze sections? Has anyone tried this? Has anyone successfully made this without the coconut? I can’t find unsweetened coconut locally. Could you make this recipe without the shredded coconut? It’s the only ingredient I’m missing. We loved this! We don’t use refined sugar, so I used a couple squirts of raw honey instead of the sugar. I also put a little coconut oil in the bottom instead of spray. Next time I’ll probably double it and use a 9×12. Thanks for an awesome recipe! It’s a keeper for sure! Delicious!! One of our favorites! I add extra blueberries and chia seeds! My family really enjoyed this. One day I didn’t have blueberries, so I chopped up apples, and added macadamia nuts, mixed this with some cinnamon and a bit of nutmeg and substituted it for the blueberries. They liked it even more. This is a great recipe to play around with if you don’t happen to have the blueberries. It can be drizzled with some maple syrup too if you like it a bit sweeter. I like to take any version of this to work and briefly heat up in microwave. How do you think it would turn out with blackberries? I have loved oatmeal since I was a young boy so I couldn’t wait to make this recipe. I have been making it for a about two years and my wife and I love it. I discovered if you use frozen coconut and let it thaw out it will add moisture to the oats and all the dry ingredients will evenly stick to the oatmeal. I also sometimes use a premier vanilla protein shake for the liquid to add protein. Can you sub a “flax egg” for the egg?